Interview: Forty-four years have passed since the most famous protest in sports history. But, talking to John Carlos in London this week, perhaps what is most striking is how few athletes have followed the example of the 1968 Olympian and used the five-ringed circus and the unrivalled platform it provides to make a stand on a political or social issue. The forthcoming London Games promise to be more sanitized, more awash with corporate sponsors than ever before, but the likelihood of an athlete using their fame to make a political statement is slim. Back in ’68, Carlos and his US team-mate Tommie Smith won bronze and gold respectively in the 200 metres but shocked the world and especially the International Olympic Committee (IOC) by using the medal podium to unleash a multifaceted protest against a range of issues. These included the treatment of black people in the US and racial segregation in South Africa and Rhodesia, as well as paying tribute to hundreds of Mexican students who had been massacred shortly before the Games that were held in their capital. Smith and Carlos each raised a black-gloved fist to represent strength and unity. They wore beads around the necks to highlight the history of lynching in the US and they took off their shoes to symbolize the poverty that still plagued much of the US, both black and white. 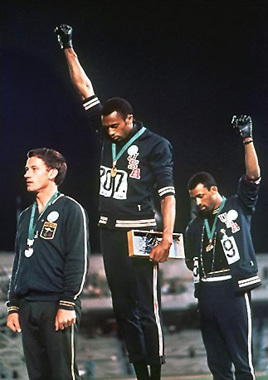 Smith, Carlos and Australian silver medalist Peter Norman also wore badges bearing the emblem of the Olympic Project for Human Rights, an organization of which Smith and Carlos were members and which had advocated a boycott of the Mexico City Olympics in which they were now present. From the stands there was a deathly silence. “You could have heard a frog piss on cotton,” Carlos recalls in his new book. However boos and abuse soon rained down on the trio, but far worse persecution would follow in the years to come. Carlos is 67 now, but when I meet him he appears to have lost none of the passion which drove him all those years ago. He carries the scars too, one of them a visible limp from an injury he suffered while trying to forge an ill-fated career as a gridiron player after he was ostracized from the U.S. athletics team. Indeed, he is well aware that his experiences post-1968 make him as much an example to be feared as followed. He struggled to find work in the 1970s, had to steal or gamble on more than one occasion to provide for his family, suffered torment at the hands of the FBI and saw his marriage to his beloved wife Kim disintegrate. Tragically Kim would take her life in 1977 after years of battling depression. 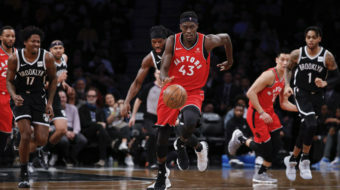 Still, he is buoyed by a number of recent examples of sports persons and sports teams in his native US, who have made a variety of stands on political issues. He also believes that the rise of the Internet and the diversity of the media means that the vilification he, Smith and the likes of Muhammad Ali suffered is unlikely to be repeated today. Gone are the days when a handful of columnists could shape national opinion. But as Carlos points out, one person’s politics is another person’s non-politics. Brundage long campaigned for South Africa’s inclusion in the Olympics, arguing that a country’s internal politics should be ignored while conveniently overlooking the fact that allowing the apartheid state’s inclusion would also be a political move and one which would give them legitimacy. I wonder what issues Carlos would be campaigning for if he were 40 years younger and competing at July’s Games. I suggest that perhaps Saudi Arabia’s refusal to send a women’s team to the London Games might be an issue that a young John Carlos would have targeted. Carlos seems reluctant to delve to deeply into the issue. He is clearly of the view that the US has historically not always been in the best position to preach to others. “We can’t act like we’re this clean, purified people, saviors to society who do everything right, because we’ve been just as guilty as (apartheid) South Africa and many other countries,” he says. That Carlos has felt ashamed of his country comes across loudly in his book. He still has good reason to feel resentful of a homeland, which robbed him of his livelihood, brutalized his family and ultimately left him penniless. Yet he has been proved to be on the right side of history. His legacy has endured and flourished, while the stock of those who opposed him, most notably Brundage, has fallen spectacularly. Later that day, Carlos addresses a 1,000-strong audience in London, where he receives a standing ovation. It is a recognition that is long overdue. This story originally appeared in Britain’s Morning Star newspaper. Photo: The salute was a noted human rights protest and one of the most overtly political statements in the 110 year history of the modern Olympic Games. African American athletes Tommie Smith and John Carlos performed their Black Power salute at the 1968 Summer Olympics in Mexico City. Via Wikipedia.